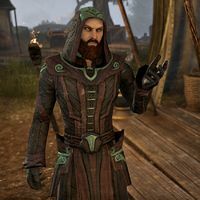 Telenger the Artificer is a respected Altmer member of the Mages Guild. Having led various expeditions, he is an experienced researcher and explorer. His hands-on approach to field research often leaves him and his students in need of aid. Later on he will be part of the invasion force heading to Coldharbour and will aid you during your time there. Telenger is also the author of several books. An Act of Kindness: Help free the ancient spirits of Ezduiin from an eternal curse. The Arbordawn Cult: Assist Telenger with a problem at the Falinesti Autumn Site. The Mallari-Mora: Help Telenger the Artificer recover an ancient relic. The Weight of Three Crowns: Convince all three alliances to invade Coldharbour. "Ah, at last. You must be here with my supplies. Just put the ink and delicate items in the tent here. You can begin unloading the bulk goods with my assistants." Sorry, I don't have any supplies for you. What are you doing here? "Truly? This is the last time I trust an order to that Bosmer. It fits, though. Ezduiin has been one disaster after another. First, the spirits. Now the supplies. And to top it off, my top scholar and her team are missing!" "Stars, yes. Andewen and her team are somewhere in the ruins, looking for the Mallari-Mora. They're long overdue. If you're not here with supplies, perhaps you'd go look for them?" I'll go look for them. After agreeing to help him, you can ask him further questions. "Best-case scenario? They've found the Mora. I don't want to think about the worst-case. Too many variables." "What a curious question. But if you insist. I am Telenger the Artificer—renowned genius, author, and explorer. Ezduiin is my latest endeavor. I will bring futher [sic] glory and honor to the Mages Guild!" "I've come in search of the Mallari-Mora. I'll present it to the council and reap the rewards." Is that the artifact you mentioned? "Quite attentive. Yes, the Mallari-Mora is an ancient relic. A talisman. Its power took the lives of everyone here. Cursed their immortal souls." The spirits have been here ever since? "No, actually! They weren't here when we arrived. Though it's merely conjecture, I believe someone has rediscovered the Mora. The disturbance of the talisman has caused the bound dead to stir." "She used to be one of my prized students. Very accomplished. She's now a high ranking member of the Mages Guild—the Master of Incunabula. She oversees the Arcanaeum in Skywatch." What is she doing out here? "Assisting me, of course. Andewen is a true seeker of knowledge. She may care for her books, but research in the field is her first love." What was that word? Incanbull? "Incunabula. She oversees research and training. A coveted position. One that most of my students aspire to, but few will obtain." Aside from Andewen's team, is anyone else out there? "Yes, now that you mention it. Sirinque, one of my students, said something about freeing the spirits. She's nowhere near as analytical as Andewen. I think she's down at our forward camp. I'm sure she's fine." Once you have saved the students and retrieved the Mallari-Mora, you can return to Telenger. "You return. I am almost afraid to ask, but—what news?" Uricantar is dead. And I have the Mallari-Mora. "Remarkable. I'm not easily impressed, but you've done it. And Uricantar disappoints, to the bitter end. Such a waste." I'm glad I was here to help. "All that remains is to tend to the wounded. And continue the research. With the Mora in hand and Uricantar dead, Ezduiin will soon be at peace. I'll see to it. " He will then reward you by giving you the Artificer's Bolt. Talking to him right after this, he'll say, "I can't wait for the chance to present this to the council. With Andewen, of course. Valaste and I will have much to discuss." Vanus Galerion will point Telenger out to you as you walk the path to the meeting place. It will quickly become clear that the pair do not get along. Vanus Galerion: "Wonderful. It's Telenger." When you approach the snide remarks intensify. Vanus Galerion: "Here's Telenger the Artificer, himself! Must it always take a crisis to pull you away from your toys, Telly?" Telenger the Artificer: "Vanus. Your robes smell of failed experiments and your words of failed wit." Vanus Galerion: "Tell me, Telly, what Dwemer rubbish pit did you crawl out of this week?" Telenger the Artificer: "You really must learn to respect your betters, old friend." Vanus Galerion: "Do let me know when one happens by, won't you?" Vanus Galerion: "I don't have the time or the energy, Telenger, so I'll bid you good day." If you speak with Teleger before you head off, he will say, "Getting the leaders to cooperate will be no small task. I hope you're up for it." After the Alliance leaders agree to allow the Guilds to enter Coldharbour, he will be at the front of the crowd waiting for Vanus to open the portal. He will make a prophetic comment the nature of Coldharbour, saying, "Molag Bal's realm is one of the most dangerous and inhospitable places in all of Oblivion. We must not take this invasion lightly." Though you do not interact with him during this quest, you do observe a projection of his conversation with Lady Clarisse Laurent while they are trapped in the Library of Dusk. Telenger will be trying convince Lady Laurent that they need to escape but Laurent will have started to succumb to the trap's effects. "I'm rather busy right now. Come back later." Are you the artificer who arrived with the Mages Guild? "Would you like me to be? I think my imitation of him is nearly perfect, don't you? But now that you've discovered my deception, you have to die." "No, not even a little. You won't find your artificer. And you'll never leave here alive!" The fake Telenger will then drop the disguise and attack you as a Dusk Scholar. When you approach the chamber he was last seen in, you find that he has gone but not after leaving a note. In the letter Telenger says that he locked himself in a vault, so he could remain clear-headed enough to plan an escape. After fighting your way through the library to the vault you can speak with Telenger through the bars of the vault door. He appears to be of sound mind but he has discovered something while in the vault. "I take it that you are the one who read my note? The spells I placed upon it alerted me that non-Daedra eyes examined the writing. I do hope that you are a member of the force from Tamriel. If so, I have something to show you." "This vault contains a portal, and the power emanating from it is overwhelming. Something on the other side seeks to pierce the veil of illusion that hangs over this ruined library." Do you think it's dangerous? "Hmm. That's inconsequential. Whatever it is, it may serve a purpose in our battle against the lord of Coldharbour. If we can acquire it, then this excursion will not have been a complete waste of time." You must have some idea what this source of power is. "I have my suspicions, but I hate to speculate. If you must know, I think it might be one of the fabled Lights of Meridia—the sources of power she used to hurl the Hollow City into Coldharbour. Come in and we shall investigate further"
Once you have unlocked the vault you can speak with Telenger further. "Enter the portal and find the source of the power I sense emanating from the other side." Why do you want me to do this? "Because I don't completely trust myself. While I have avoided the illusions that trapped the others, I can still feel the pull of the Daedric spell. Find the power source and meet me at our camp outside the ruins. And take this token, just in case." What does the token do? "Once you go through the portal, the token will attune itself to the access point. If you get lost, use the token and it will return you to the portal. What was once a curiosity that won me fortune and acclaim is now a vital tool in our mission." 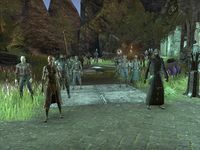 With the Teleportation Trajectory Token in hand, enter the portal and retrieve the Light of Meridia located on a floating island. With some unexpected help from King Laloriaran Dynar you will be able to land near the camp where Telenger is waiting for you. "Welcome back, my friend. Did you find it? Was I right? 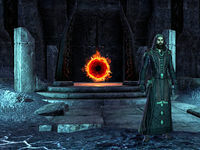 Was the source of power I sensed one of the fabled Lights of Meridia?" You were right. I found this on the other side of the portal. "By the Eight! That crystal! It is a Light of Meridia! It is said that these orbs of power once allowed Meridia to transport an entire city into Coldharbour. If an agent of Meridia harnesses this power for us, we shall gain a distinct advantage." Afterwards you can ask him what his immediate plans are. "With Meridia's Lights, we can turn the tide of this campaign. Kireth said you came from the Hollow City. We shall go there once everyone has had a chance to rest. Thank you for your help. You know, you remind me of one of my students." "Once inside the Hollow City, we'll begin helping with the war effort. We must test the Lights of Meridia and investigate methods for destroying Molag Bal's Planemeld mechanism. There is always research to do in campaigns such as this." After rescuing him from the Library of Dusk, Telenger can be found in the Consultants' House within the Hollow City. He will be fascinated by the spellwork he experienced within the library. "For all the years I've spent researching and looking into just how the planes of Oblivion work, I still find my self astonished at every new discovery. That library for instance—I've never experienced a spell quite like that before." This page was last modified on 5 February 2019, at 18:57.